Draft: 2000, Anaheim Angels, 17th rd. Full name MICHAEL ANTHONY NAPOLI...Single...Twitter: @MikeNapoli25... Graduated from Charles Flanagan High School in Pembroke Pines, FL in 2000...Earned High School All-American 1st team...In January 2015, the Boston chapter of the BBWAA presented Mike with the Tim Wakefield Award, recognizing his charitable spirit in community service...Honored at the Boston Children's Hospital Champions for Children dinner...Made multiple visits to the hospital and purchased tickets for patients as part of his Bearded Bunch program and spent time in the hospital visiting victims of the Boston Marathon bombings...During his time with Texas, made several appearances on the club's Winter Caravan in 2012...Prior to his time with the Rangers, assisted with Angels youth baseball clinics and charitable events. In his age-34 season, posted career highs in home runs (34), RBI (101), games (150), plate appearances (645), runs (92), hits (133), and walks (tied-78)…his 78 walk ranked 10th in A.L…made 149 total starts at 1st base (98) and DH (51)… started 140 games batting cleanup, with 9 starts batting 5th… finished 2nd on team in walks and runs. Split the season between Boston and Texas, acquired by the Rangers in early August as he returned to Arlington and became a key contributor in their march towards the A.L. West title..For the year, batted .224 (91-407) with 18 HR and 50 RBI in 133 games with Boston and Texas…Hit .278/.391/.563/.954 (42-151) in 179 PA's against left-handed pitching combined on the year and with the Rangers batted .364/.470/.673/1.142 (20-55) with 5 HR and 20 RBI against lefties...In his career vs. LHP he owns a career mark of .278/.390/.527/.917 (291-1045) with 68 HR and 165 RBI... Career rate of 4.34 pitches seen per PA ranks 2nd among Major Leaguers active in 2014 to Jayson Werth (4.38)...Trails only Werth and Rickey Henderson (4.36) among all players since the stat began being tracked in 1988 (min. 1,500 PA)...Hit 17 home runs for an 8th consecutive season since 2008, one of just eight Major League players to make that claim...Hit .295/.396/.513/.908 (23-78) with 5 HR and 10 RBI in 35 games with Texas after being acquired in an 8/7 trade with Boston in exchange for a player to be named later or cash considerations…Beginning 8/16, would hit .324 (23-71) in his final 29 contests with the Rangers…Started 11 of 17 games from Sept. 13-30 in left field, his 1st action in the outfield in his pro career...Ranked second on Boston's club in walks (45) at the time of the trade over 90 starts at 1st base and 2 as the DH…Over final 17 G with Red Sox beg. 7/20, hit .281 (16-57) with 7 2B, 3 HR, 10 RBI, and a .931 OPS...Enjoyed his 14th career two-home game on May 23 vs. the LA Angels (5th career game vs. LAA with 2 HR)...Has played in the postseason in 7 of the last 9 seasons (2007-09, 2011-13, 2015)...In 51 career postseason games, has hit .248 (36-for-145) with 6 2B, 7 HR, 27 RBI, and 21 BB (.785 OPS)...Is tied for the lead among active players with 14 World Series RBI (also David Ortiz) in 12 career WS games...With 3 RBI in Game 1 of the 2013 World Series, became the 1st player ever to drive in 13 runs over his first 8 World Series games...His 5 career multi-RBI games in the WS are tied with Chase Utley for the lead among actives...Led the Rangers with a .328 AVG (19-for-58) while starting all 17 postseason games during the club's run to the World Series in 2011. Hit .248 (103-for-415) with 17 HR and 55 RBI in 119 games in 2nd season with the Red Sox...Reached base via hit, walk, or HBP in 100 of 116 starts (86%)...Among AL players with at least 450 PA, ranked 11th with a .370 OBP...Drew a career-high and team-leading 78 walks, 5th-most in the AL...His 18 multi-walk games ranked 3rd in the AL...Led the majors with an average of 4.47 pitches/PA (min. 400 PA)...Marked his 2nd straight season atop that list (4.58 P/PA in 2013)...Topped MLB with a career-best .450 OBP against left-handed pitching...Hit .300 (33-for-110) in 140 PA vs. LHP compared to .230 (70-for-305) vs. RHP...Paced the Sox with 9 game-winning RBI...Hit .273 (57-for-209) with 6 HR at home compared to .223 (46-for-206) with 11 HR on the road...Made 109 starts at 1B (110 games)...Also started 7 games at DH...Reached safely in a career-high 33 straight games from 4/4-5/14 (.267, 32-for-120, 25 BB, 2 HBP, .401 OBP)...Was the longest on-base streak by a Red Sox in 2014 and 2nd longest in the AL (TOR's Jose Bautista, 37 G from 3/31-5/10)...Also had 2 streaks of reaching base in 17 consecutive starts: 6/20-7/9 and 7/30-8/24...Drew a walk in a career-high 9 straight games on 2 occasions: 4/29-5/10 (14 BB) and 6/24-7/5 (10 BB)...Led the club in AVG (.305), OBP (.405), and SLG (.526) in March/April...Had the 10th-best OPS in the AL in that time (.932)...On 3/31 at BAL, made 6th career Opening Day start, 4th at 1B and 2nd in a row with BOS...Went 2-for-4 with his 1st homer of the year and a season-high 4 RBI on 4/2 at BAL...Reached base in each of his first 28 home games with a PA through 6/15 (.320, 33-for-103)...Placed on the 15-day DL on 5/25 (retro to 5/24) with a sprained left fourth finger, which was originally dislocated during a headfirst slide on 4/15 at CWS...Activated on 6/8 and hit .304 (38-for-125) with 6 2B, 7 HR, 14 RBI, 22 BB, and a .408 OBP in his next 35 games through 7/21...Had his best monthly AVG (.311) and SLG (.554) in 21 June games...Clubbed 4 HR in a 9-game stretch from 6/18-28, 3 of which gave the Red Sox a lead...Hit a walk-off homer in the 10th inning on 6/18 vs. MIN off Casey Fien, the 2nd of back-to-back shots to end the game following David Ortiz's game-tying solo homer...Was his 3rd career walk-off homer, 1st since an 11th-inning shot on 7/21/13 vs. NYY...Went 2-for-4 with a home run on 6/22 at OAK, and also stole home in the 3rd inning...Became the 1st Red Sox to homer and steal home in the same game since Rico Petrocelli on 9/9/67 (Source: Elias)...Delivered a game-winning homer in the 9th inning on 6/28 at NYY off Masahiro Tanaka...Broke a 1-1 tie in the 2-1 victory...Hit a 3-run homer in the 11th inning on 8/26 at TOR off Sergio Santos, extending Boston's lead in an eventual 11-7 victory...Limited to 11 games in September...Last played on 9/17 at PIT...On 11/4, underwent successful surgery to address his sleep apnea...Procedure was performed at Massachusetts General Hospital by Dr. Leonard Kaban, Chief of Oral and Maxillofacial Surgery. In 1st season with the Red Sox, set career highs in RBI (92), hits (129), doubles (38), extra- base hits (63), runs (79), walks (73), and at-bats (498). Finished 2nd on the club in home runs (23), RBI, SLG (.482), and OPS (.842). Played in 139 games, 1 shy of his career-high (140 with LAA in 2010). His 92 RBI ranked T-11th in the AL...Placed 6th with an AVG of 5.41 AB/RBI. Tallied 6 games with at least 4 RBI, tied for the MLB lead (also Chris Davis and Alfonso Soriano)...Were the most by a Red Sox since Mike Lowell in 2007 (6Had multiple extra-base hits on 15 occasions, 1 shy of Chris Davis' ML-leading 16, and the most by a Red Sox since Kevin Youkilis in 2008 (15). Tied for MLB lead with 20 RBI and T-2nd with 7 homers against the Yankees...Jimmie Foxx (8 in 1936) is the only Red Sox to have more roundtrippers in a season vs. NYY. Led the majors with a career-high 4.58 pitches seen per plate appearances, the highest mark by a Red Sox in the last 25 years beginning in 1988 (as far back as data is available)... It was the 3rd-highest mark for any ML qualifier in the last 25 years, just shy of Brett Gardner in 2010 (4.61) and Rickey Henderson in 1994 (4.60). His 73 walks tied for 2nd on the team (with Dustin Pedroia) behind David Ortiz's 76...His 187 strikeouts set a club single-season record, passing Mark Bellhorn in 2004 (177). Went 11-for-24 (.458) with 4 doubles, 3 grand slams, 1 walk, and 31 RBI with the bases loaded...His 31 bases- loaded RBI led the majors and were the most by a Red Sox since Vern Stephens had 32 in 1950. His 3 grand slams - 4/22 vs. OAK, 6/1 at NYY, and 9/6 at NYY - led the AL and tied for the MLB lead, falling 1 shy of the club single-season record (Babe Ruth, 4 in 1919)...Were the most grand slams by a Red Sox in a season since Manny Ramirez hit 3 in 2005. Was the 1st ever Red Sox to hit 2 slams in the Bronx and just the 3rd player in ML history with 2 slams against the Yankees in a season, along with PHA's Bob Johnson in 1935 (also both in NYY) and BOS' Jimmie Foxx in 1938 (1 in BOS, 1 at NYY). Set club records for the month of April with 13 doubles and 18 extra-base hits. Twice named AL Co-Player of the Week, from 4/15-21 (with teammate Andrew Bailey), and 9/2-8 (with teammate Will Middlebrooks)...Were his 1st career weekly honors. Defensively, played exclusively at 1B for the 1st time in his career and led major league 1B with a 9.7 Ultimate Zone Rating. On 4/1 at NYY, made 5th career Opening Day start and 3rd straight at 1B (also 2011-12 with TEX)...Was the 1st Red Sox to debut for the club as the starting cleanup hitter on Opening Day since Manny Ramirez in 2001. Had a 5-game streak from 4/14-18 with an extra-base hit and an RBI (5 2B, 3B, 9 RBI). Hit .345 (10-for-29) with 5 doubles, a triple, a home run, and an ML-leading 10 RBI in 7 games from 4/15-21 to earn AL Co-Player of the Week Award. Was the 1st Red Sox with both 25 RBI and 14 XBH (9 2B, 3B, 4 HR) before the club's 20th since RBI became an official stat in 1920. Totaled 22 XBH and 31 RBI in the club's 1st 28 games, just the 2nd major leaguer to do that since 1990 (Alex Rodriguez in 2007). Drove in a season-high 5 runs on 4/22 vs. OAK, going 2-for-4 with a double and his 1st grand slam since 7/8/11 for TEX vs. OAK. Had a season-long 15-game on-base streak from 5/29-6/18 (14 H, 8 BB, HBP). On 7/21 vs. NYY, had 2 homers, including an 11th-inning walk-off shot off Adam Warren...Became the 1st Red Sox since Vern Stephens on 5/30/51 with 2 homers, including a walk-off shot, in a game against the Yankees...It was his 2nd career walk-off homer, also 9/12/08 for LAA vs. SEA, and his 5th career walk-off RBI (2nd in 2013, also 4/15 vs. TB). Snapped and 0-for-16 slide with a game-tying, 2-run shot in the 9th inning on 8/14 at TOR...His 1.144 OPS from that day through the end of the season topped MLB (min. 100 PA). Limited to 7 starts in a 15-game stretch from 8/15-9/1 and played in only 3 of the club's last 7 games to end the regular season. Led MLB in September in OPS (1.227), SLG (.733), and OBP (.494)...T-4th in the AL with 6 HR in the month...Had a .333 AVG (20-for-60) in 20 games in September. Ejected for 1st time in his career on 9/15 by home plate umpire Ron Kulpa after striking out in the 6th inning. Re-signed by the Boston Red Sox as a free agent on 12/12. Went 10-for-46 (.217) with 4 doubles, 2 homers, 7 RBI, and 6 walks while playing 15 of the club's 16 postseason contests en route to the World Series Championship…Started 12 of the club's 13 postseason games played at AL parks and reached base safely in all but 1 of those starts…Started all 4 ALDS games vs. TB…Hit .300 (6-for-20) and led the Sox with 2 homers, 4 extra-base hits, and a .700 SLG and 1.033 OPS in 6 ALCS games vs. DET (5 starts)…Knocked in only run in a 1-0 win at DET in ALCS Game 3 with a solo HR off DET's Justin Verlander in the 7th inning…Was just the 11th player in MLB history to go deep in a 1-0 game in the postseason, and the 4th to do it in the 7th inning or later…Homered to lead off the 2nd inning off Anibal Sanchez in Game 5 at DET to put the Sox ahead 1-0…Tied a career postseason high with 3 hits in ALCS Game 5 at Comerica Park…Played in 5 World Series games vs. STL (3 starts)…Drove in 3 runs with a bases-loaded double in the bottom of the 1st inning of World Series Game 1 in Boston…Knocked an RBI single in the clinching Game 6. Hit 24 home runs in 108 games for the Rangers and earned 1st career All-Star selection.Ranked 6th in home run rate (14.7 AB/HR) and 8th in walk rate (56 BB, 7.5 PA/BB) among AL players with at least400 PA...CWS's Adam Dunn was only major leaguer with better rates in both categories (13.2 AB/HR, 6.2 PA/BB)Joined TOR's Jose Bautista (27 HR) as the only players with at least 24 homers in fewer than 350 at-bats.Saw 4.41 pitches per PA, trailing only Dunn (4.43) and LAD's A.J. Ellis (4.43) among big leaguers.Led the club with 69 starts at catcher, with the Rangers going 37-32 in those games...Also made 24 starts at 1st base and 9 at DH...Caught 8 of 50 (16.0%) base runners attempting to steal, including5 of his last 17 (29.4%).Had 4 games of 3 or more walks, tied with 5 others for most inthe majors.Had 3 different multi-homer games: 4/17 at BOS, 7/21 at LAA,and 9/30 vs. LAA (G2).Went deep in a career-high 5 straight games from 4/15-21 (G1),with the streak ending as a pinch-hitter in the nightcap...Matchedthe 2nd-longest streak of the season in the majors...Also homeredin consecutive games 5/27-28 and 9/30-10/1...Had 3 hits and 4 RBI in consecutive games from 4/17-18 at BOS, the 1st Ranger to do that since Juan Gonzalezin 1998...Was the 1st opponent with at least 3 hits and 4 RBI in consecutive games at Fenway Park since OAK'sReggie Jackson from 6/14-15/69.Started behind the plate for the AL in the All-Star Game on 7/10 in KC...Topped AL catchers with 4,317,718fan votes...Played the 1st 5 innings, going 1-for-2 with a single.Of his last 21 hits beginning 7/21, 12 were home runs.Missed 33 games on the 15-day disabled list with a left quad strain from 8/11-9/14...Tried to play throughthe injury after multiple days off from 8/7-9, but was finally shut down...Batted .267 (4-for-15) with 3 homers, a double, and 9 RBI on a 4-game rehab assignment with Triple-A Round Rock.Hit 7 homers and drove in 16 runs over his final 16 regular season games following the DL stint...Collected 6 RBI on 9/30 vs. LAA (G2), matching a career-high for the 2nd time (also 8/25/10 for LAA vs. TB). Had starts at catcher (57), first base (27), and DH (18),ranking among team's top 3 in starts at each position...ranked 2ndon the club in walks (58) and 3rd in homers (30)...established career highs in hits (118), home runs, doubles (25), runs (72), RBI(75), total bases (233), and walks...had 432 plate appearances,70 shy of qualifying for league leader status... among A.L. playerswith 400+ PA's, ranked in average (6th, .320 ), OBP (3rd, .414),and SLG (1st, .631)...among players in Rangers history with atleast 400 plate appearances, finished among club's all-time single-season leaders in OPS (2nd, 1.050), slugging (4th), and onbase pct. (6th)...became just the 3rd Ranger with at least 400 PA's in a season to bat at least .300 with a .400 OBP and .600 SLG...only other player in the majors to do it in 2011 was Toronto's JoseBautista (.302/.447/.608)...was on the disabled list, June 12-July3 with a strained left oblique muscle...played 4 games on an injuryrehab assignment with Round Rock (AAA), going 4-for-15 (.267)with 3 homers and 9 RBI. Led the Angels in homers (26) and slugging (.468), tiedfor 4th in doubles (24), and ranked 5th in RBI (68)...set careerbests for games (140), at bats (453), hits (108), doubles, homers,and RBI ... batted a team best .305 (43-141) vs. left-handed pitchingbut hit just .182 (20-110) with runners in scoring position ... tiedfor 7th in the A.L. in strikeouts (137) and tied for 8th in hit by pitches(11) ... was 0-for-3 in 2 starts as the designated hitter and 0-for-6with 2 walks as a pinch-hitter. Spent fourth full season with Angels as part of catching tandem with Jeff Mathis...Set career-highs in games(114), runs (60), hits (104), HR (20 - tied) and RBI (56)...His 20th HR on last day of season gave Angels fourplayers with at least 20 HRs for first time since 2000...His 62 career HRs as a catcher are a club record (previously61 held by Bengie Molina and Lance Parrish)...20 home runs finished T6th among MLB catchers...Club record forhome runs in a single-season by a catcher is 22 by Lance Parrish in 1990...Hit .330 (31/94) vs. LHP...Was 23-for-64 (.359) with three home runs and 11 RBI in 18 games as a DH...Made first career start as DH May 1 at NYY...Hit"walk-off" double with two outs in 10th July 23rd vs. Min...Had career-high four hits July 31 at Minn. for thirdtime of season (also June 16 & May 4). Made second Opening Day roster and split catching duties with Jeff Mathis (made 71 starts behind the plate)...Enjoyed best season in Majors posting career-highs in average (.273), hits (62), home runs (20), RBI (49) and stolen bases (7)...His 20 home runs ranked second most by an Angel catcher in a single-season (Lance Parrish hit 22 in 1990)...Homered once every 11.4 at-bats...His .586 slugging percentage led Angels...Is just third catcher to hit at least 40 career HRs as Angel (46)...Bengie Molina and Lance Parrish share the record (each hitting 61 HRs)...Finished season on a tear with 18 hits in his last 27 at-bats (.667) to raise season average from .225 to .273...Had multi-hit efforts in seven of last eight starts including four 3-hit games...Named Angels' Player of the Month for September as he led with a .453 average (24/53) and six home runs... Connected for first career walk-off HR with two outs in 9th inning Sept. 12 vs. Seattle...Drove in four of Angels' five runs twice in a game in September (9/12 vs. Seattle & 9/28 vs. Texas)....Connected for 10 home runs in his first 27 games of season...Activated from 15-day DL August 7...Placed on 15-day DL July 7 due to irritation right shoulder... Marked third DL stint of career (2 in 2007)...Logged third multi-HR game of his career May 18 vs. Los Angeles with a career-best five RBI...Hit first career grand slam in 2nd inning April 9 vs. Cleveland...Underwent arthroscopic surgery on right shoulder (irritation) October 31, 2008. In sophomore season with Angels, batted .247 (54/219) with 40 runs scored, 11 doubles, onetriple, 10 home runs and 34 RBI in 75 games...Missed 44 games in two DL stints...Placed on 15-day DL July 28 with strained right hamstring suffered while sliding into second base in the first inning July 27 vs. Detroit...Placed on DL July 2 with a high left ankle sprain suffered while tagging out Melvin Mora at homeon a game-ending double play July 1 at Baltimore...Logged 30 RBI his last 46 games with an at-bat...Posted career-best 14-game hit streak May 8-28 (.354; 17/48)...Scored a run in 10 straight games played (5/11-27)...Marked longest runs scored streak by catcher since Johnny Romano of CWS in 1961...Threw out 13-of-62 basestealers (21%)...Made first career Opening Day roster. Napoli burst onto the Major League scene and batted .310 with 10 home runs in his first two months with the Angels. Once the league adjusted to the rookie catcher, it became a struggle. Napoli hit just .174 over the season's final three months, but he wasn't sent down to Triple-A Salt Lake because manager Mike Scioscia liked his game management behind the plate. Napoli homered in his first career at-bat against the Tigers on May 4. In jump from Class A to Double-A Arkansas, led Texas league in home runs (31) and RBI (99) after leading CaliforniaLeague in each category (29 HR and 118 RBI) in 2004...Finished second in league in extra base hits (55) and fifthin slugging percentage (.508) and runs scored (96)...Limited to one HR over first 29 games and two HRs through 36games before connecting for 30 HRs over final 95 games...Posted two multi-HR games (June 17 at Wichita, 2 HR & 8RBI and August 12 at Frisco)...Was Arkansas' top performer in seven post-season games, hitting .346 (9/26) with 4HR and 9 RBI, as Travs won Eastern League Championship before losing to Midland in Championship Series...NamedTexas League Player of Week, May 23-29 and to Texas League Post-Season All-Star Team and as Texas League All-StarGame selection...One of top offensive performers for Aguilas in Dominican Winter League. Enjoyed breakout season with Single-A Rancho Cucamonga, hitting .282 with 29 HRs and 118 RBI...Was league's leader in home runs (29) and RBI (118, No. 7 in minors) and was fourth in league in sluggingpercentage (.539) and extra-base hits (62, tied)...Among all minor leaguers, ranked seventh in RBI and ninthin walks (88)...Posted 10 games with at least 3 RBI, including a 6-RBI output, July 15 at Lancaster (5/5, 4 R, 1HR, 6 RBI)...Named Angels' Organizational Player of the Month for April (.343, 7 HR, 24 RBI) and May (.333, 8HR, 35 RBI)...Other accolades included: California League Post-Season All-Star Team, California League Playerof the Week three times (April 11-17, May 3-9 and July 12-18) and California League All-Star Game Selection. Limited to 47 games with Rancho Cucamonga...Underwent surgery to repair torn labrum in right shoulder...Surgery was performed by Dr. Lewis Yocum. Spent campaign with Single-A Cedar Rapids and hit .251 with 10 HRs and 50 RBI...The club finished 81-58and won Midwest League's West Division before losing both games of Semifinals to Peoria Chiefs...Was club's primaryDH (60 games) and played 37 games as catcher. Participated in extended Spring Training...Played seven games with Rancho Cucamonga before havingcontract transferred to Cedar Rapids...Connected for four of five home runs over seven-game span, July 26-Aug. 3. A lower back strain limited him to 10 games with rookie level Butte after being drafted in June. November 2, 2018 1B Mike Napoli elected free agency. September 26, 2018 Columbus Clippers activated 1B Mike Napoli from the 7-day disabled list. April 19, 2018 Columbus Clippers placed 1B Mike Napoli on the 7-day disabled list. April 6, 2018 1B Mike Napoli assigned to Columbus Clippers. 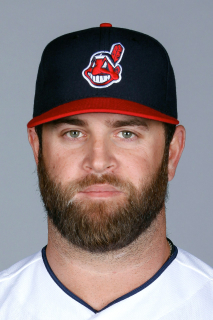 February 28, 2018 Cleveland Indians signed free agent 1B Mike Napoli to a minor league contract and invited him to spring training. November 6, 2017 1B Mike Napoli elected free agency. June 16, 2017 Texas Rangers activated 1B Mike Napoli from the 10-day disabled list. June 15, 2017 Texas Rangers sent 1B Mike Napoli on a rehab assignment to Frisco RoughRiders. June 6, 2017 Texas Rangers placed 1B Mike Napoli on the 10-day disabled list retroactive to June 4, 2017. Lower back strain. February 16, 2017 Texas Rangers signed free agent 1B Mike Napoli. November 3, 2016 1B Mike Napoli elected free agency. January 5, 2016 Cleveland Indians signed free agent 1B Mike Napoli. November 2, 2015 1B Mike Napoli elected free agency. August 8, 2015 Texas Rangers activated 1B Mike Napoli. August 7, 2015 Boston Red Sox traded 1B Mike Napoli and cash to Texas Rangers for Player To Be Named Later. June 8, 2014 Boston Red Sox activated 1B Mike Napoli from the 15-day disabled list. December 12, 2013 Boston Red Sox signed free agent 1B Mike Napoli. January 22, 2013 Boston Red Sox signed free agent 1B Mike Napoli. November 3, 2012 C Mike Napoli elected free agency. September 15, 2012 Texas Rangers activated C Mike Napoli from the 15-day disabled list. September 11, 2012 sent C Mike Napoli on a rehab assignment to Frisco RoughRiders. August 11, 2012 Texas Rangers placed C Mike Napoli on the 15-day disabled list. Left quadriceps strain. July 4, 2011 Texas Rangers activated C Mike Napoli from the 15-day disabled list. June 30, 2011 sent C Mike Napoli on a rehab assignment to Round Rock Express. January 25, 2011 Toronto Blue Jays traded C Mike Napoli to Texas Rangers for cash and RHP Frank Francisco. January 21, 2011 Toronto Blue Jays traded CF Vernon Wells to Los Angeles Angels for C Mike Napoli and LF Juan Rivera. June 14, 2000 Anaheim Angels signed C Mike Napoli.